While Sears has struggled mightily since 2007, it actually looks good by comparison to J.C. Penney on two important metrics: revenue and cash balance stability. Retail analysts have become increasingly discouraged by J.C. Penney's (NYSE:JCP) poor performance since former CEO Ron Johnson first shook up the company's strategy in early 2012. Revenue dropped by 25% in fiscal year 2012, and the board's decision to fire Johnson last month clearly implied that the company was not making progress. Accordingly, analysts (on average) projected that J.C. Penney's sales would drop by 13.1% for the first quarter. However, once again, analysts were too kind to J.C. Penney. On Tuesday afternoon, it released some preliminary financial data for the first quarter, indicating that revenue had dropped by 16.4%. J.C. Penney also noted that it ended the quarter with $821 million of cash and cash equivalents -- after drawing $850 million from its credit line! This indicates that the company burned through roughly $900 million in the quarter. It's hard to fathom the extent of J.C. Penney's fall, which is more or less unprecedented in the retail industry. Even Sears Holdings (NASDAQOTH:SHLDQ) -- the poster child for retail disappointments -- has not suffered a meltdown quite like it. With the aid of two examples, I will try to convey a sense of how dramatic J.C. Penney's plight has been, even compared to Sears. J.C. Penney's sales peaked at $19.9 billion in 2006 and 2007; last year's total of $12.98 billion already represented a 35% decline from that peak. J.C. Penney could even flirt with a 40% decline, depending on its 2013 performance. By contrast, while Sears has seen steady sales declines for years, its sales drop has still been more moderate overall. Sears revenue has dropped 21% since 2007 to just under $40 billion, and is now 25% below the all-time high of $53 billion in 2006. J.C. Penney and Sears Holdings revenue percentage declines, data by YCharts. J.C. Penney's steep sales decline is even more notable because it has occurred despite an increase in the number of J.C. Penney stores from 1,067 in fiscal year 2007 to 1,104 in fiscal year 2012. In the same time period, Sears has shrunk its store count from 2,825 to 2,270 (counting only company-owned stores). Since operating expenses are highly correlated with the store count, J.C. Penney's sales declines have had a massive impact on profitability. While Sears has also struggled to turn a profit, it has been better able to stabilize its operations through cost-cutting. The dramatic fall of J.C. Penney's cash and investments balance is another illustration of the company's difficulties. Despite the slow economy in 2008 and 2009, J.C. Penney managed to build up a war chest of more than $3 billion by early 2010. However, the company has squandered it in the ensuing three years: Had it not tapped its credit line last quarter, it would have run out of cash completely. 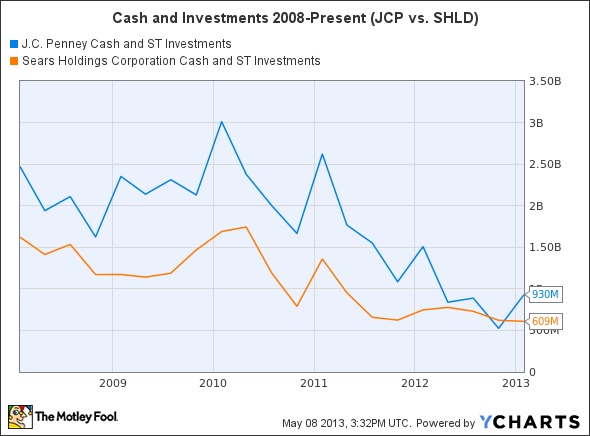 J.C. Penney and Sears Holdings cash and investments balances, data by YCharts. The depletion of J.C. Penney's cash owes a lot to the activist investors who have targeted the company, most notably Bill Ackman. Ackman encouraged the company to spend $900 million buying back stock when it was trading for more than twice its current value! Then he helped recruit Ron Johnson, who began implementing an expensive (but ill-fated) transformation plan for J.C. Penney. By contrast, while Sears has also experienced a gradual decline in cash reserves, it has managed that weakness more effectively. I would not consider investing in either J.C. Penney or Sears Holdings. Both have experienced declining (or nonexistent) profitability over the last five years, and there are no obvious "green shoots" at either retailer to justify hopes for a turnaround. 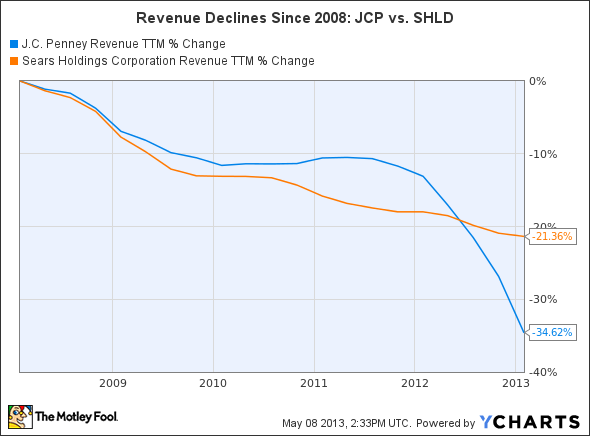 However, J.C. Penney appears to be in much worse shape than Sears. The latter's executives have had years to manage the company's decline and slowly invest in initiatives that could pay off in a best-case scenario. J.C. Penney's outlook is much bleaker as revenue declines (particularly on a per-store basis) and cash burn have spiraled out of control.